Back home in Australia. The last few weeks in Nepal have been busy and productive. So much has happened it is necessary to break up the journey into sections. We finally got there! This trip was made possible by a special lady, Dr. Sara Parker, a university lecturer from Liverpool UK. Due to the fuel shortages in Nepal TUFA were unable to afford the cost of a jeep to transport the required supplies of warm jackets and winter medications for the village and surrounding areas. Sara called out to her many contacts in the UK and overnight raised funds to cover the costs involved to get our team to Gatlang! We were overwhelmed by her kindness and that of all the people who donated.....thank you. Sara has written 2 amazing books. 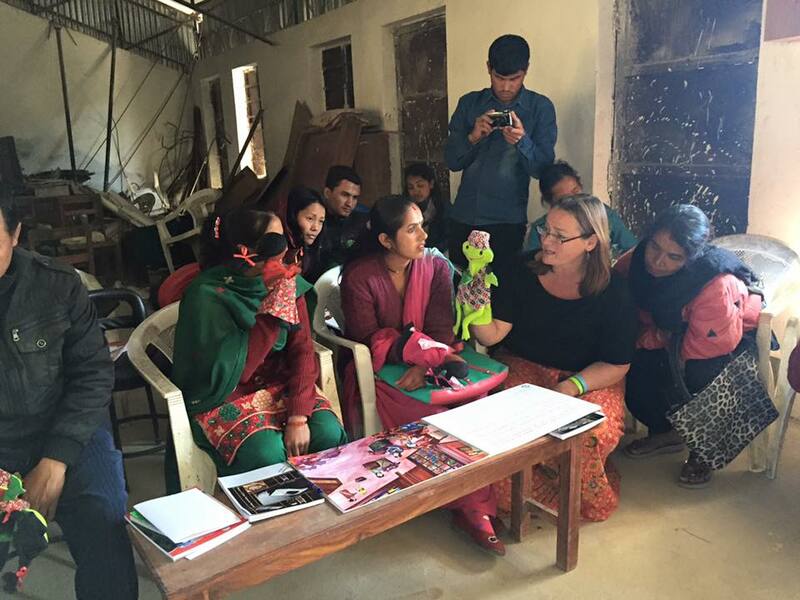 One is 'Faris the travelling Nepali Frog' with a puppet show attached and the other 'Our Village Our Life' a project in the village of Sikles located in the Annapurna region. Contact us at Umbrella for further information about purchasing Sara's books. Our team who travelled to Gatlang was made up of myself, Margaret (Newcastle Aus. ), Maja (Sweden), Josephine (Denmark) and of course, our wonderful driver Ram (Nepal). Before we left our trusted friend Rajesh Lama informed us of the essential items that were needed ahead of the cold winter weather. 172 warm jackets were required for the elderly in the village and there was a shortage of medications such as paracetamol (adults & children), cough elixir, hydration powders, vitamins, antibiotics etc. all delivered to the health worker at the temporary medical post. Leaving the Kathmandu valley one can see the total devastation from the April/May earthquakes. Thousands of landslides and displaced communities around every corner, the daily reality of how people are surviving and not getting assistance from their government is apparent. The winter months will bring many deaths to the young and elderly through exposure to the cold and food shortages. Gatlang is now a pile of rubble with the community spread across the mountains living under plastic. The children are still smiling and happy and the resilience of the people is amazing. Christmas came early for our team as we had the opportunity to hand over warm jackets to many frail elderly people, some who had walked a day to receive these jackets. We felt privileged to have this opportunity which could have happened without our supporters in Australia who donated money for their purchase. Enjoy these photos and their smiles as you helped us to achieve this.